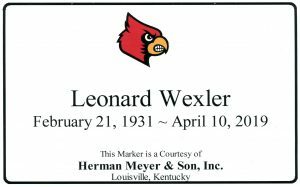 Leonard Wexler, 88 – Herman Meyer and Son, Inc.
Leonard Wexler, 88, of Louisville, died on Wednesday, April 10, 2019. He was born in Brooklyn, NY to Bert and Eileen on February 21, 1931. From NY he moved to Chicago, graduated from the University of Illinois, and later earned his MBA from the University of Chicago. There he married Frances Levin, had 3 children, and his life and career flourished. Life in Louisville began in 1980 when he accepted an executive position with Glenmore Distilleries. He and his wife fully enjoyed the Louisville community. As a member of Standard Club, he developed many friendships over regular golf games and poker. He was a lifetime member of Financial Executives Institute. He earned the Jewish Community Federation Ronald & Marie Abrams Volunteer of the Year award in 2000. Somehow, he always had time for U of L Basketball as a season ticket holder. Leonard is survived by his sons, Lawrence J. Wexler and his wife Deb Dusansky, and Bruce H. Wexler and his wife Paula; his daughter Donna A. Wexler and her husband Tracy Towns; grandchildren Alex and Matt Wexler and Chava and Elie Kornfeld. Leonard was preceded in death by his wife, Frances. A celebration of Leonard’s life will be held at 12:00 p.m. Sunday, April 14 at Herman Meyer & Son, Inc. 1338 Ellison Ave. Visitors are welcome at 11:00 a.m. Mr. Wexler will be laid to rest next to his wife at Cave Hill Cemetery during a private ceremony. Memorial contributions to your favorite organization are welcomed. Family and friends are invited to a reception at Miralea, 320 Joe Conway Circle, from 2:30-5:00.